Whether in the office, among friends or even strangers, gossip is something that we are exposed to every day. The Oxford dictionary definition of gossip is: Casual or unconstrained conversation or reports about other people, typically involving details which are not confirmed as true: chiefly derogatory; a person who likes talking about other people's private lives. Gossip can be extremely negative, as it is rarely founded on the truth, it's intentions are seldom honorable and it has the potential to cause a great deal of harm. Superficially, it can induce irritation, upset and hurt while at the deep end it can lead to complete character assassination, conflict and even death. People in the midst of gossip may say, "Oh, it's just harmless chit-chat." Gossip is rarely harmless as it is often based on a target: the "prey" of the gossip. One may ask, "Well how are we supposed to know what is going on without gossip?" This is where news comes in. News is based on facts and pertinent information. A professional and honourable news reporter will not write an article simply based on what someone told them, they will check out the facts and will ask questions before publishing a story for all to read. Relevance: If, for example, it's a case of "I heard that John's wife left him for another man. She'd been having an affair for years," while you are discussing your next client presentation; what is the relevance of this statement to the conversation? Is John part of the team? If not, then this statement has no relevance or use. If yes, then of course if his performance has dropped there may be some relevance, however there is a way to handle personal situations professionally and there is no need for everyone to know all the details. Facts: is the information being shared based on fact or on hearsay? Compare "There's a chance we're going to be made redundant next week. My boss just told me that the board meeting she attended on Monday ended with the decision that major cuts are going to be made the across middle office", with "I heard we're all going to get fired next week". What is the origin of the information? Is it a case of chinese-whispers or is it coming from a reliable witness? Credibility: Is the person sharing this information a close friend or colleague who you believe has your best interest at heart? Is this someone who likes to discuss everyone's business and jumps to share the latest intrigue? What is their track record of honesty? How much do you trust them? How do you feel about their integrity? How do they treat other people? Intention: Intention is, in my opinion, a key factor that helps decide whether information falls in the category of news or gossip. What do you believe the intention behind the disclosure of the information you are receiving is? Is this a sharing of pertinent news that is important or useful? If someone is discussing another person who is not present, what is the purpose of them being brought into the conversation? The body language of the informant can give you some tips. When sharing information about others is it open, do they have a positive tone of voice, or is their tone conspiratory and their body language furtive? Notice the words they are using when discussing others. Are they positive, factual, detrimental? Feelings: Do you feel positive about hearing more on this topic, or anxious that if you hear more you will be prying or be part of something that is private and not for your ears. Do you feel that the sharer of information has the absent person's best interests at heart? There is a big difference between "I heard that Jean lost her job, I hope she's doing OK and wonder what we could do to help?" 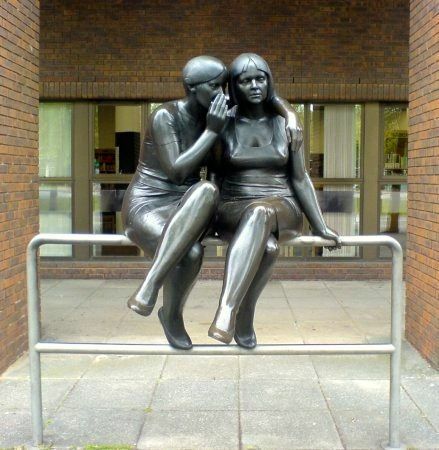 and "Did you hear that Elise and Gary got it on in the photocopying room last night". Do you feel these people have been brought into conversation in order for positive action to be taken or do you feel that there is another motivation? If the latter, read on. Motivation: Sometimes people can feel insecure and try to make themselves seem knowledgeable and powerful by gossiping. Perhaps they are trying to impress you. They could be trying to gain favour with you by sharing private information about others that they think you might like to know. They may love to collect stories about others and by sharing with you, hope that you will release some private information to them that they can pass on. They may be driven by drama and intrigue or uninspired in their own lives and thus focused on the lives of others. Remember, no matter how nice they are, there is a strong likelihood that if they gossip about others to you, it will be hard for them to keep any private information you give them to themselves. Ideas on how to extricate yourself from or neutralize gossip. Be curious: Gently ask the person "What's the purpose of you sharing this with me?". If there is a call to action required you will find out very soon. If it's a case of pure juicy gossip, they will probably be left high and dry. Change the topic: If someone says to you "I heard that Peter didn't make that promotion and that he had a big fight about it with his boss", you could reply with "Is that so?" and quickly point something out such as, "The sunrise was amazing this morning, did you see it? ", or "Wow it was busy coming in to work today. What do you think about the new transport system?". If the gossip persists: Excuse yourself and politely walk away and get on with something else more productive. This is more easily done when in a group. In a one-on-one situation, e.g. over lunch with a colleague, you could say something along the lines of "I'd much rather use our time together to hear about you and what's going on in your world". If none of the gentle approaches work: Don't worry, I'm not about to suggest you rugby tackle the gossiper to the ground and sellotape their mouth closed! A kind but firm. "How do you know that to actually be true? Were you there at the time?" or "I'm not interested in hearing any more on this topic", should stop any gossiper in their tracks. Few if any of us are immune to gossip and it can at times be tempting to join in, particularly in those grey areas between gossip and news. If ever in doubt of how to proceed I invite you to consider the words of the sufi master Rumi. Before speaking, ask yourself: Is it true? Is it necessary? Is it kind? How do you differentiate between gossip and news?